Krista and I went to Pix Patisserie tonight with our friends Keith, Kim and Shasta. I laughed when I saw this old advertisement in the hallway near the bathroom. 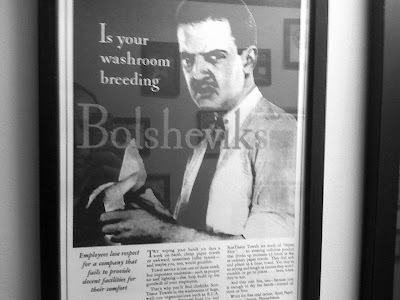 Basically, it says that a business with rough paper towels is breeding Bolsheviks in the bathroom. Now that's comedy.